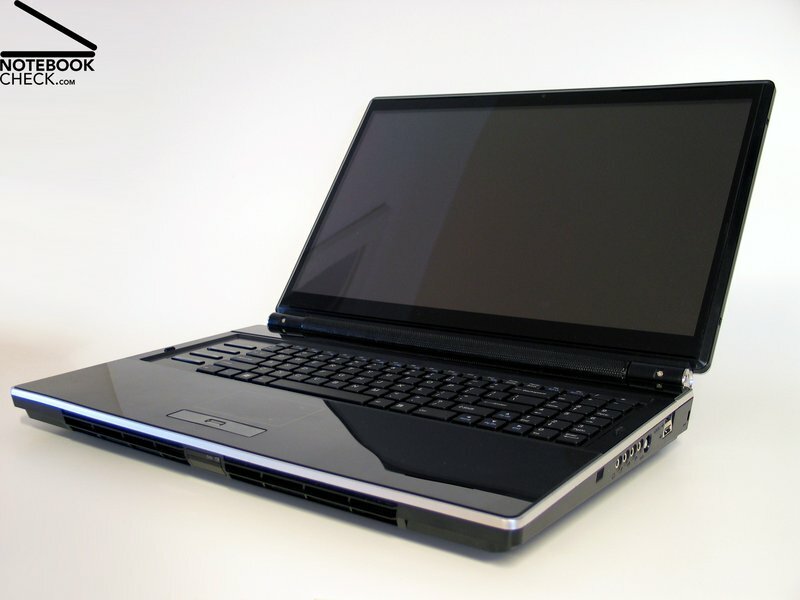 At the same time nVidia launched the Geforce GTX 280M graphic cards, the barebone manufacturer Clevo introduces the M980NU notebook. 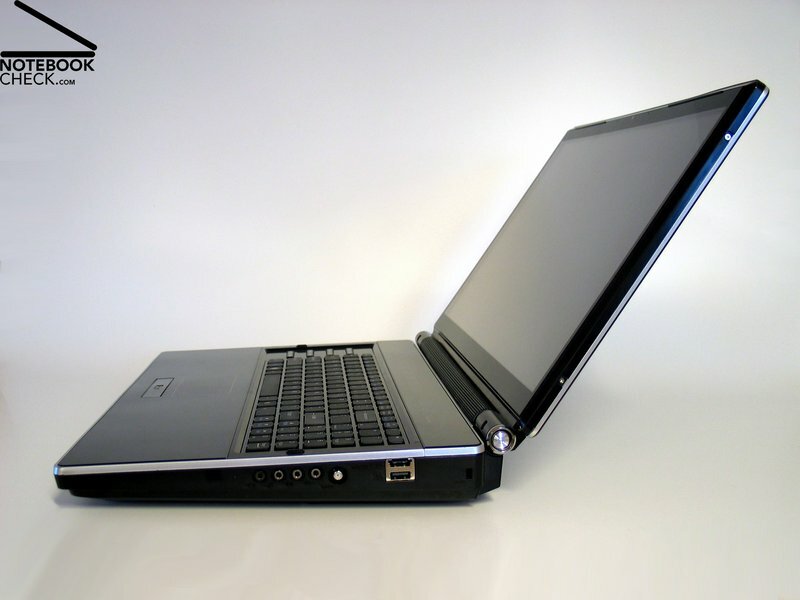 Thereby this 18.4 inch desktop replacement notebook is able to host most up-to-date hardware, e.g., the mobile quad-core processors from Intel or up to two of the new GTX 280M graphic cards in SLI connection. We had the opportunity to take a closer look at a first pre-sample. Note: All of the following tests, measurements, and pictures are done for a pre-sample. So, it might well be that the finally released notebooks could differ in some aspects. It is apparent that a 18.4 inch screen needs an appropriate big case. In the case of the Clevo M980NU this results in a weight of 5.350 kilogramme (without power adapter) and a size of 280x438x64 millimeter. So, once you have unpacked it you better keep it on the desk. 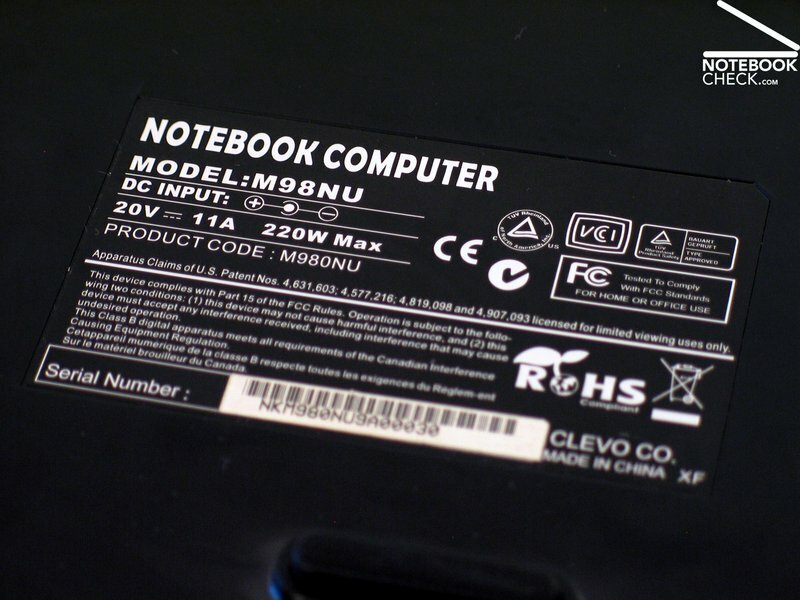 The design of this notebook very much resembles some Clevo colleagues of the XXL-category, e.g, the D901C. 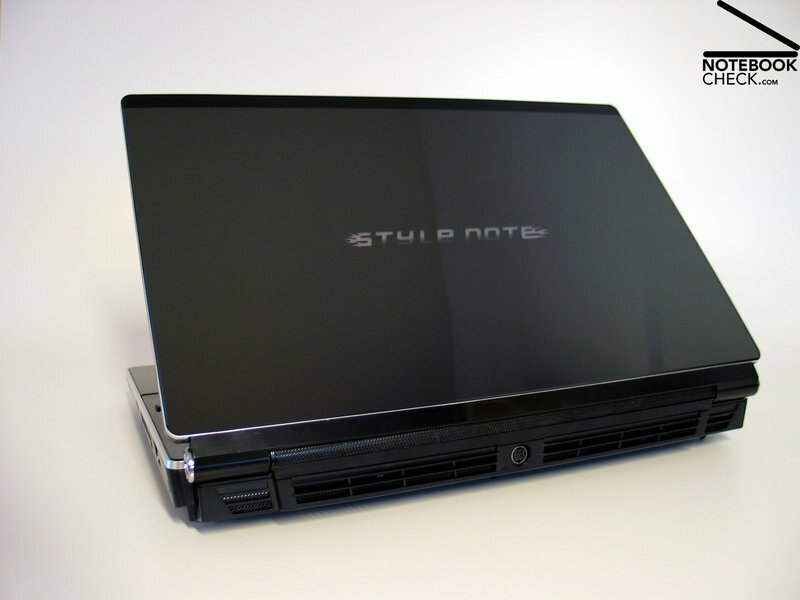 Contrary to the popular M570TU barebone, the case of the M980NU does it without a colourful design. Only a silver molding on the base unit puts a small accent on the case. 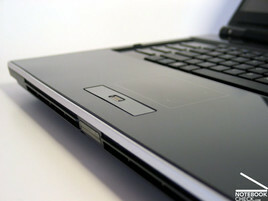 However, after power on, the notebook is highlighted by a literal play of colours of numerous built-in LEDs. E.g., the hot keys, but also the openings for loudspeaker and fan at the front and at the back side, shine in various (configurable) colours. 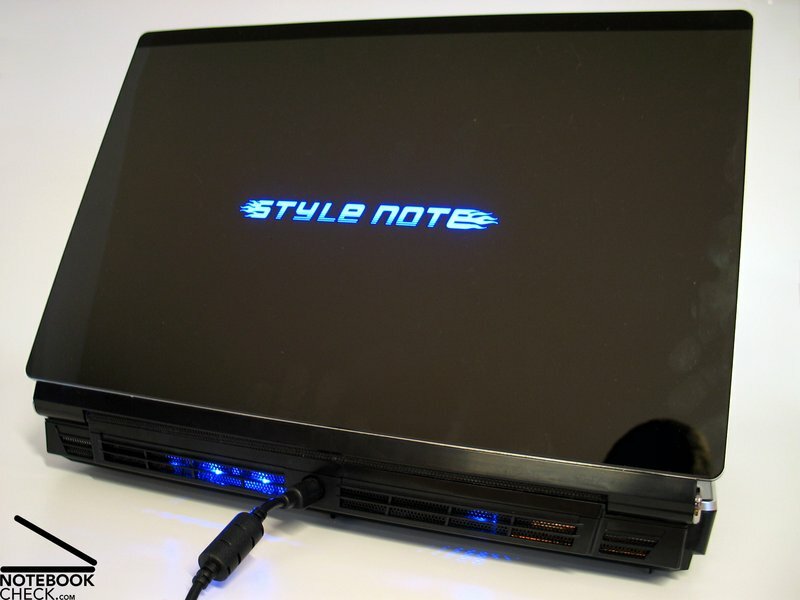 Also at the lid, the label 'Style Note' is highlighted by illumination and even the touchpad comes with a colored shiny frame. Except of the showy lights the case looks rather simple and decent. That is beside of the size, but even this does not look bad. The wedge-shape of the base unit, which lets the parts appear thin, contributes to this impression. 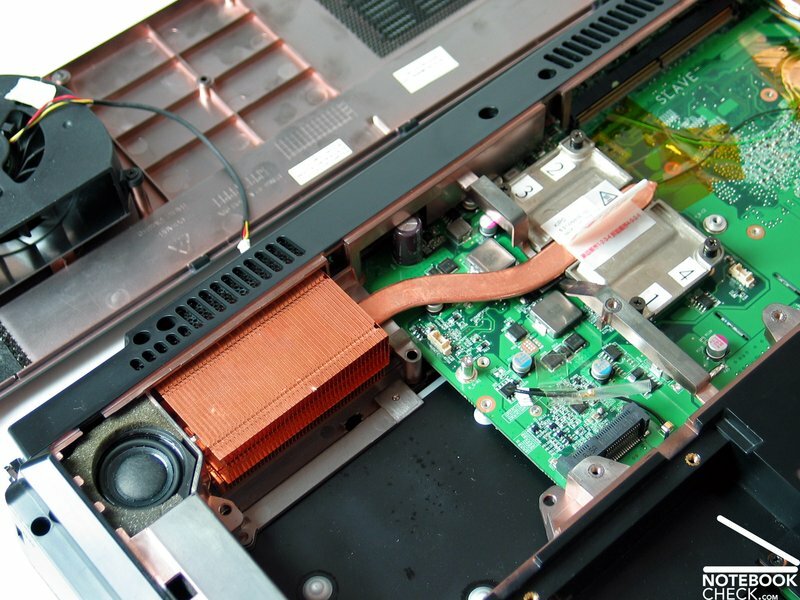 A similar concept was already successfully implemented in the M570 series. Statements about workmanship might not be significant yet, because we reviewed a pre-production model. If the surfaces at the palm rests and at the display lid are still glossy in the final model, you can say that they at least look good. However, they are also sensitive to dirt and fingerprints will quickly accumulate. Because the front and also the back of the M980NU are occupied by the vent hole and the loudspeakers, only the flanks are available for interfaces. However, because of a total height of 6 centimeters these should, nevertheless, provide plenty of space. 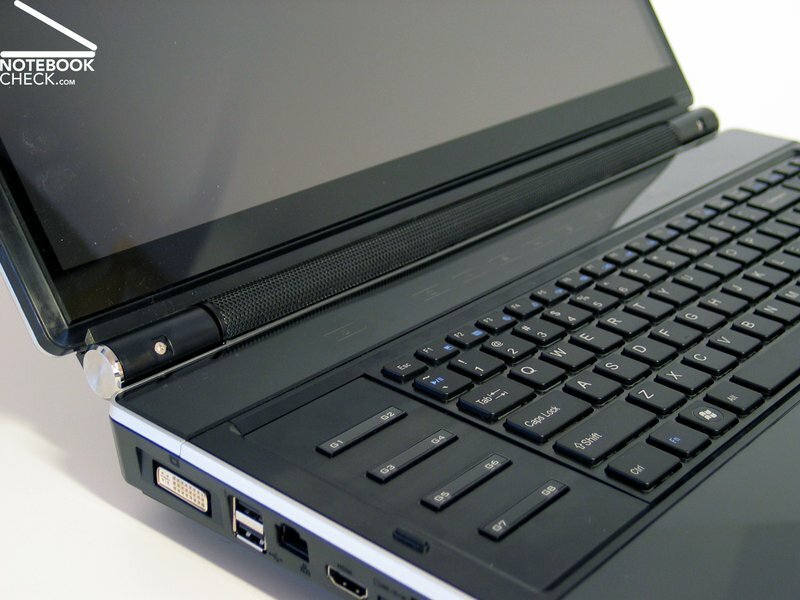 In total 4 USB ports are offered, one of them is a combined eSATA/USB interface. 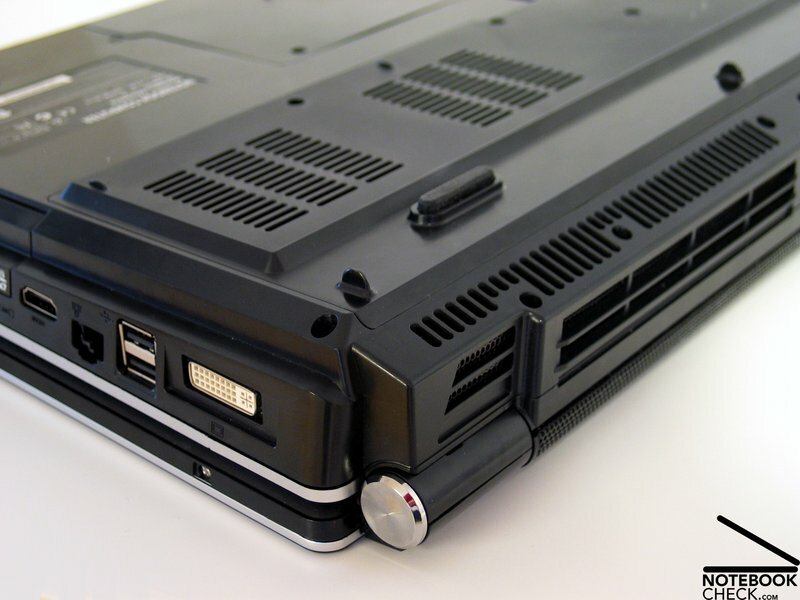 In addition you'll find a DVI-port and an HDMI-out on the left side of the case. 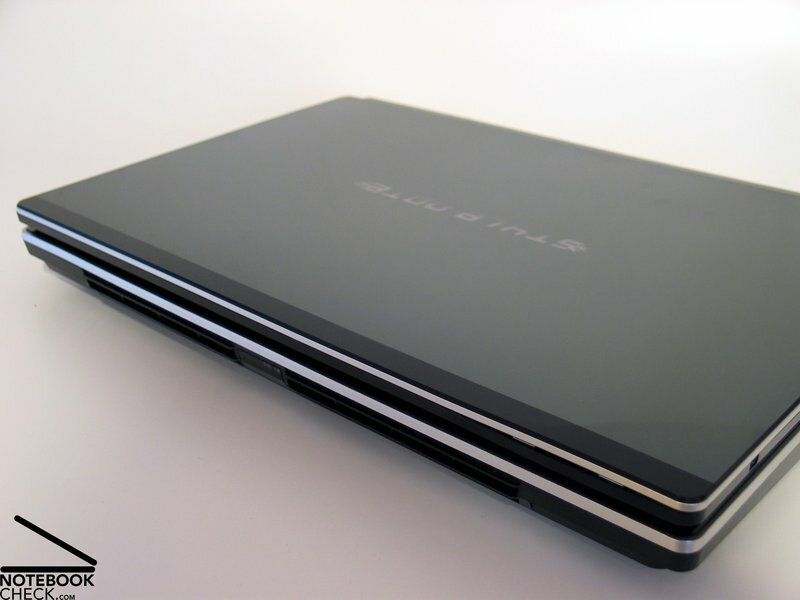 This side also houses a LAN-port, a FireWire port, the optical drive, and an ExpressCard slot. 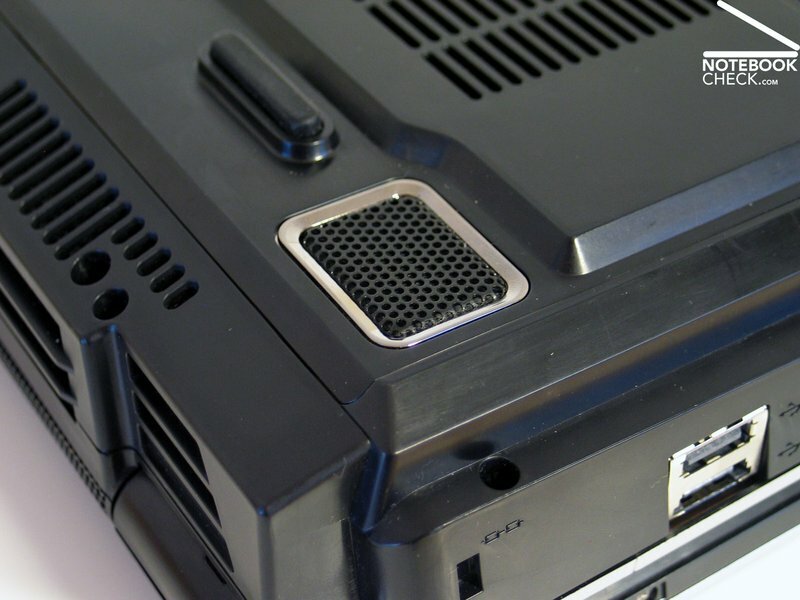 The opposite side, the right one, provides an antenna port if the model is equipped with a TV-card, and the audio ports. Overall, the order of the ports is alright, because they are in the back parts of the sides. 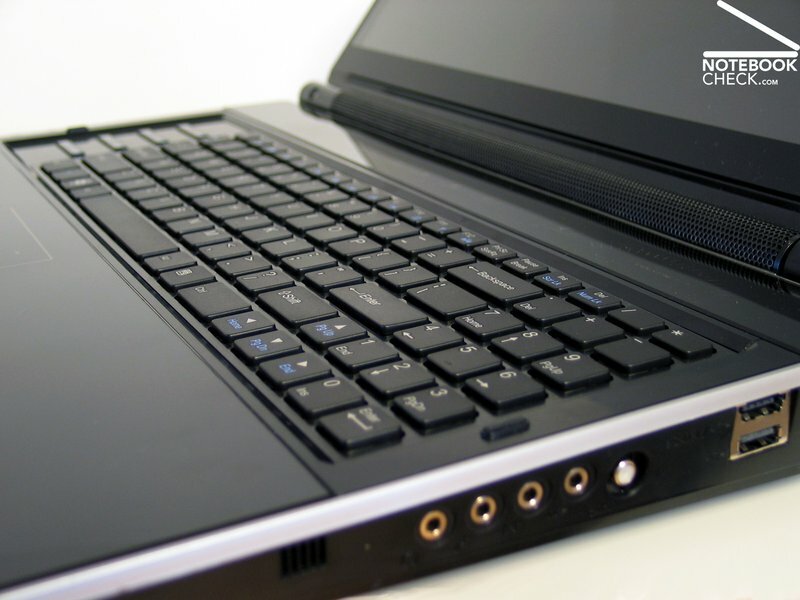 Only the audio ports could cause problems for righties, if they are in use all the time. The keyboard is a little bit off center in the huge base unit. This is, because of a column with hot keys left of it. However, in the pre-sample its look could not really convince. The keyboard was, so to say, designed in a 'Sony-Style', that is, each key is separated from the others and individually embedded in the case. Typing can be characterized by a rather short key travel. However, because the partly provisional connections in the pre-production sample, we cannot say much about this now. 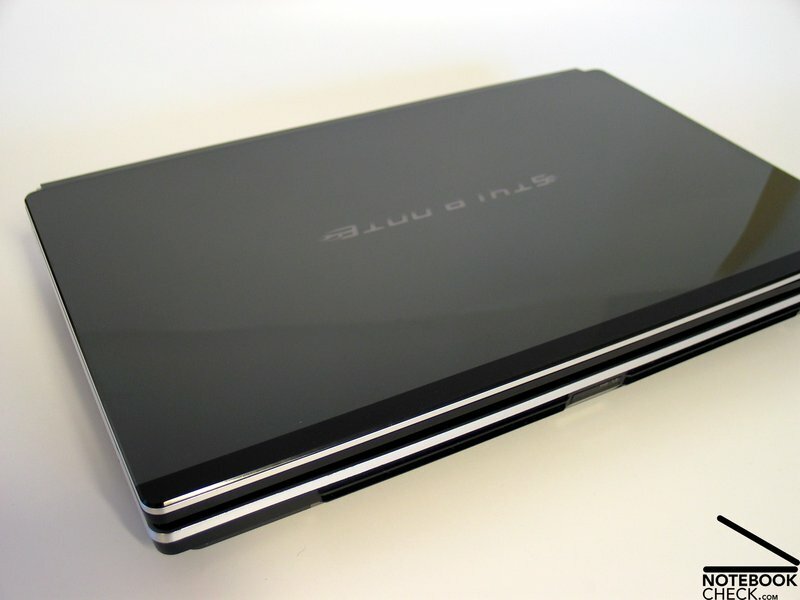 The touchpad looks very attractive, because it is absolutely flush with the case and even has the same high-gloss surface. However, it is not really a convenient mouse replacement in case of need, because its surface is sticky and so uncomfortable in use. If this is not changed in the production-models, this would indeed be a point of critique. But, to be fair, it is note-worthy that the need for a touchpad is anyway rather limited, in a notebook with comparably low mobility. 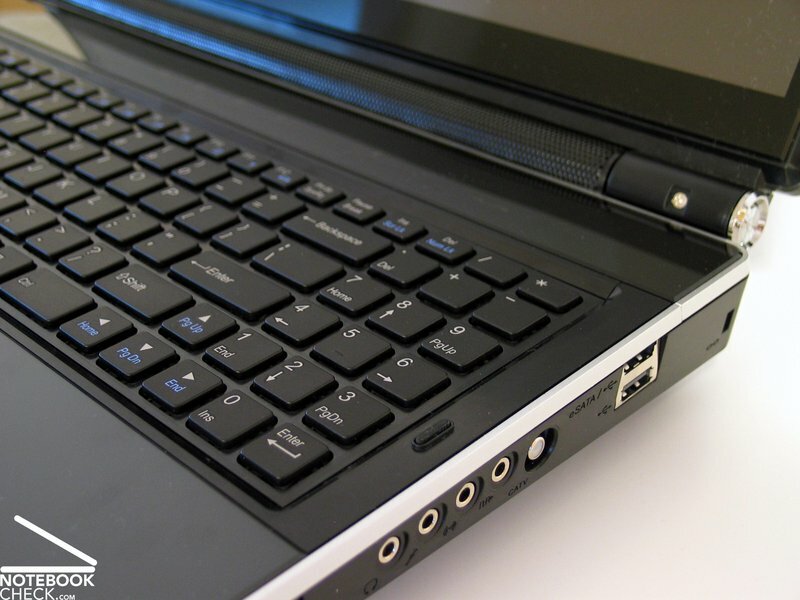 The hot keys above the keyboard are realized by touch-sensitive areas, which are colurful illuminated by LEDs. However, they did not really response well to user actions in the pre-sample. The volume control, a touch-sensitive illuminated semicircle, does not look too good. The reviewed sample of the Clevo M980NU was equipped with a 18.4-inch display with a resolution of 1920x1080 pixel, that is full-HD. In our measurements this panel achieved a maximum brightness of 220 cd/m² in its center, a rather passable value. Because the brightness falls towards the corners, it only attains an illumination of about 74.4%. However, in terms of contrast this screen scores points. With a minimum brightness (black value) of 0.37 cd/m² it achieves a very good maximum contrast of 595:1. 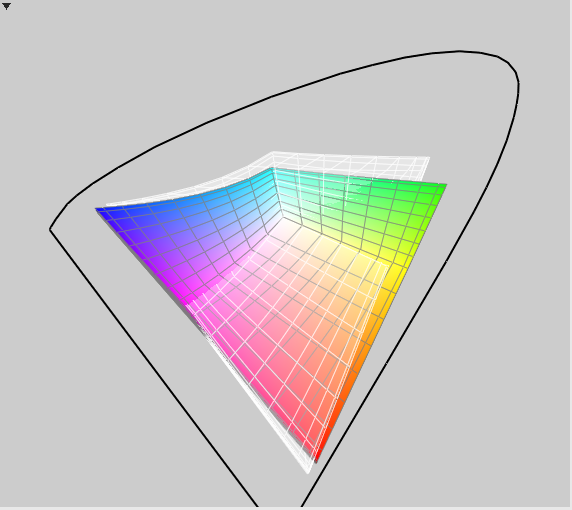 Also in regards of color representation we looked closer at the display of the M980NU. 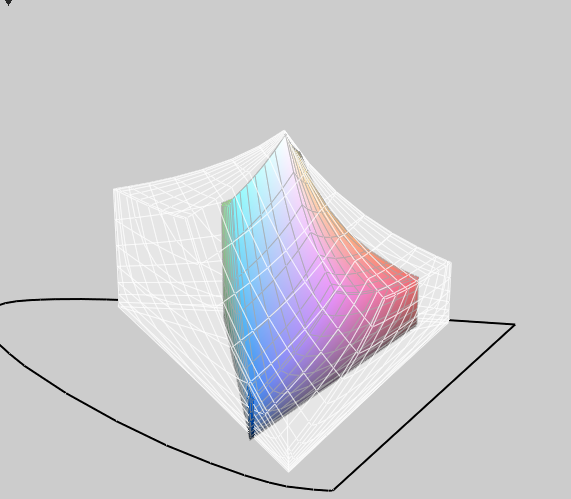 The results of our measurements done by means of the Spyder 3 tool from Datacolor were throughout positive. 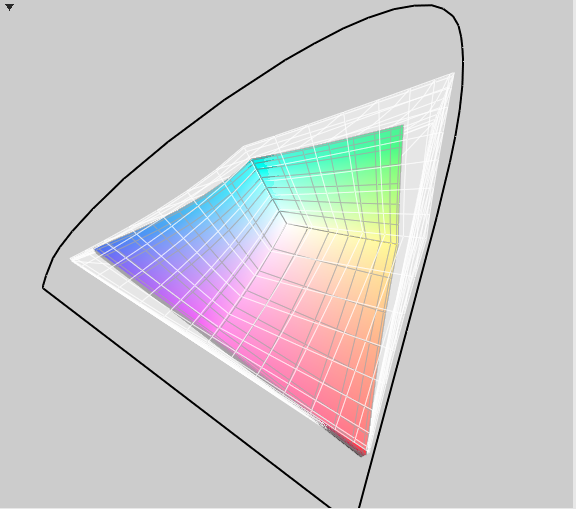 E.g., the representable color space of the built-in full-HD panel is clearly bigger than the standard of contemporary notebook displays. 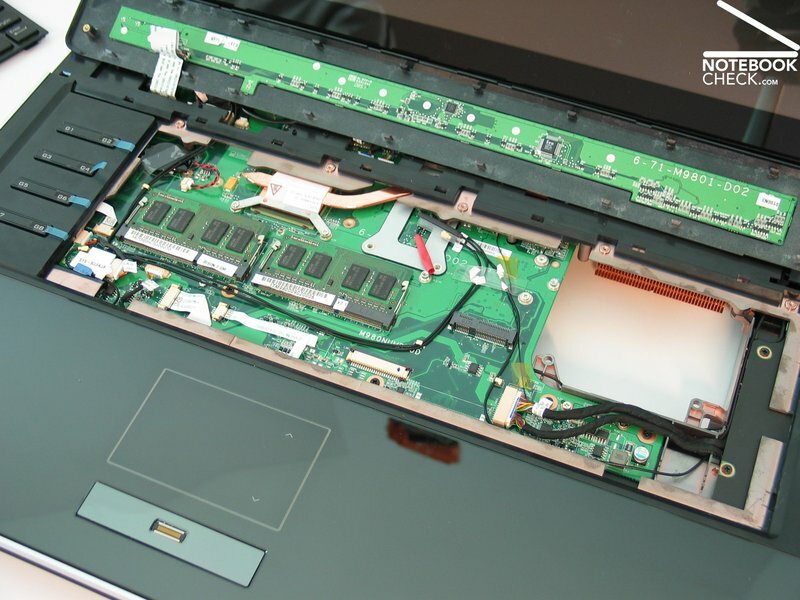 Only special RGB-LED panels, like the one of the Dell Studio XPS 16, are still better than this panel. Also in terms of viewing angles the used full-HD display convinced. In horizontal plane they are throughout wide. 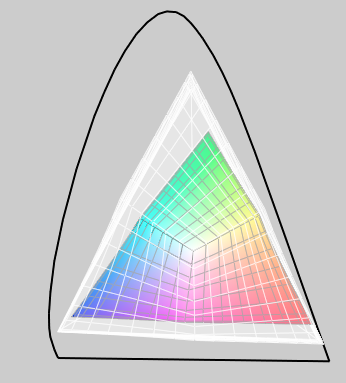 Also with a viewpoint aslant above the screen, the picture stays surprisingly stable. Only from below, disturbing distortions arise quicker. 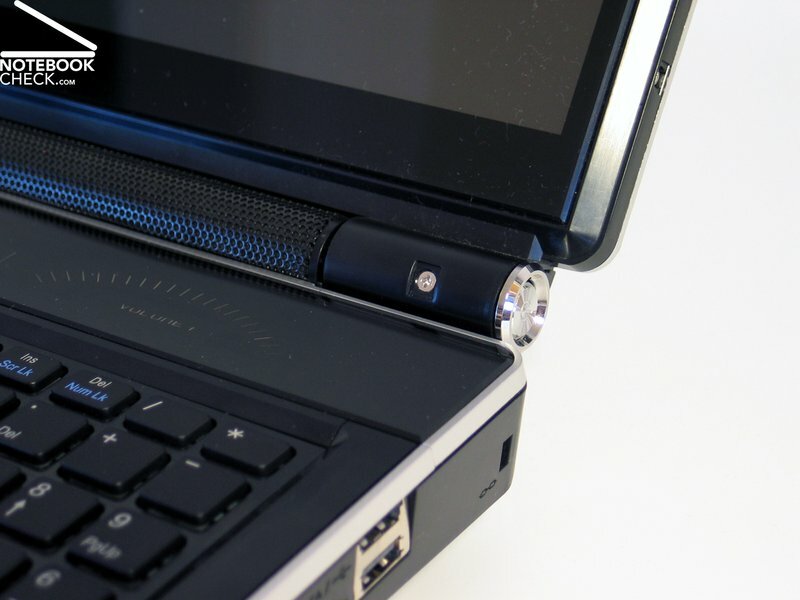 The Clevo M980NU clearly focuses on built-in hardware. You could nearly come to the conclusion that the case was designed around the planned hardware equipment afterwards. That is no surprise as the case should be able to house contemporary and coming high-performance processors and also up to two graphic cards and believe it or not up to three hard drives. 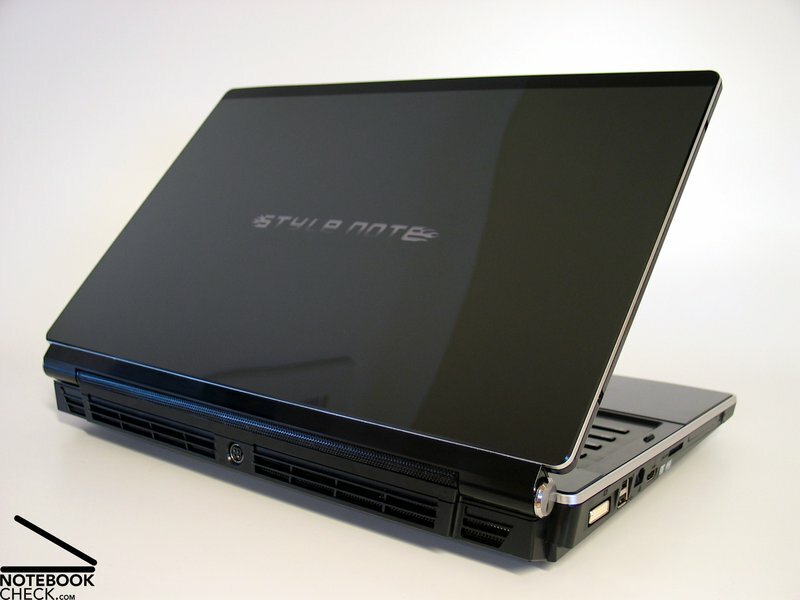 The reviewed model was equipped with a X9100 Extreme CPU from Intel with a clock rate of 3.06 GHz. 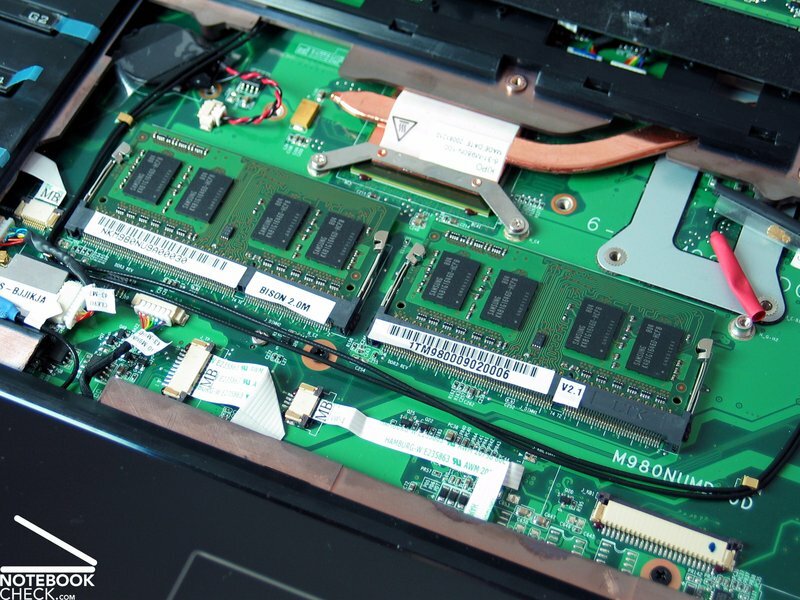 However, you can assume that the M980NU can also be populated and ordered with quad-core CPUs. 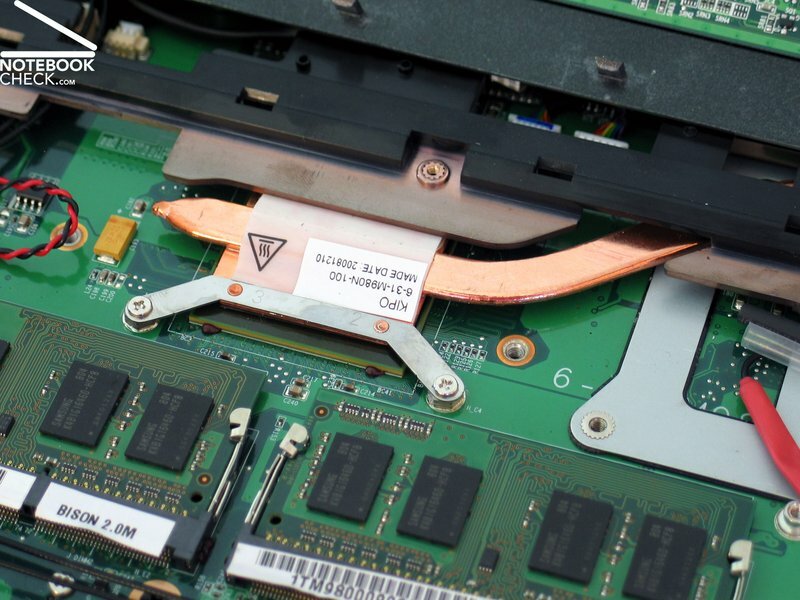 Nevertheless, the highlight of this notebook is without doubt nVidia's new flag ship in the segment of mobile graphic cards, the Geforce GTX 280M. Technically speaking this is about a Quadro FX 3700M, but, built in 55 nanometer technology with higher clock rate, or a desktop 9800 GTX with lower clock rate. It is clear that nVidia claims for the top of current mobile graphic cards. 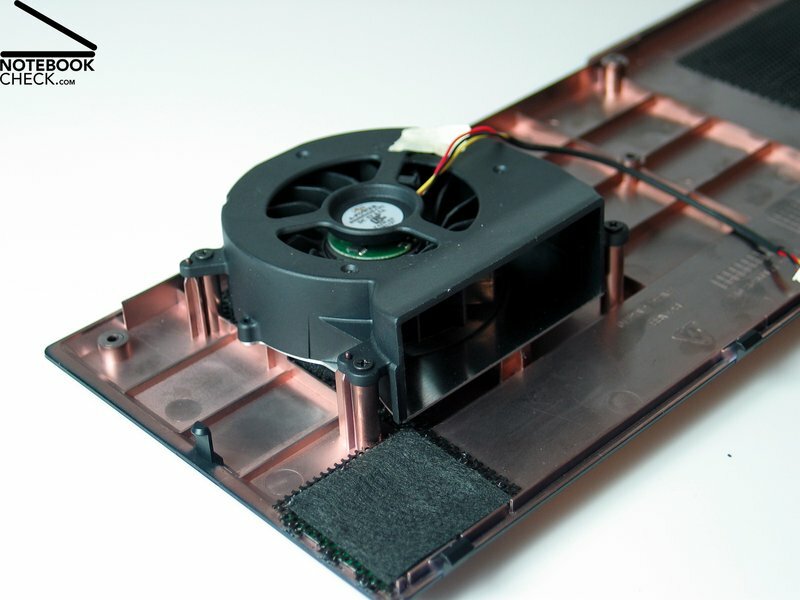 Detailed information to the Geforce GTX 280M, especially in comparison to its biggest competitor from ATI, the Mobility Radeon 4870, are available in this special article. The reviewed pre-sample of the Clevo M980NU could score points by very good results in the run tests. In the PCMark 2005 it achieved with 7203 points a respectable result. However, the values of the graphical-focused benchmarks and the game tests of current games were even much more impressive. With 11767 points in the 3D Mark 2006 benchmark test the Geforce GTX 280M inside our test sample is able to reach a respectable result here too. The reviewed pre-sample only came with 2 gigabyte RAM. But, fast DDR2 memory modules (PC3-8500F) were used. 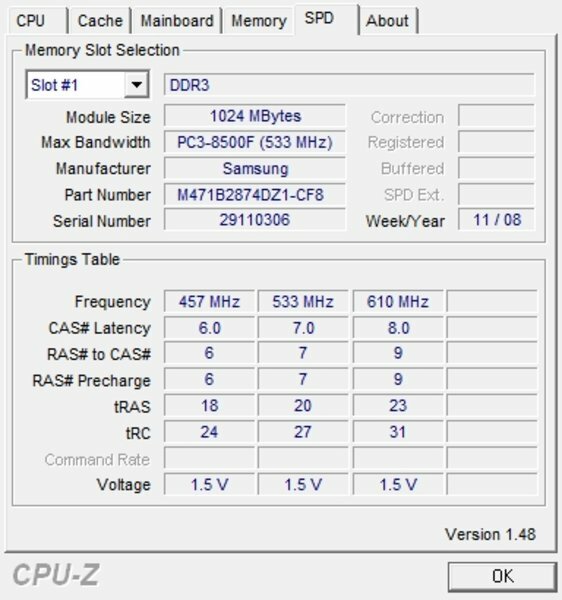 Up to now, there is no information available about the maximum supported RAM capacity. Because the Geforce 9400m chip set is used you can assume that the limit is 8GB. 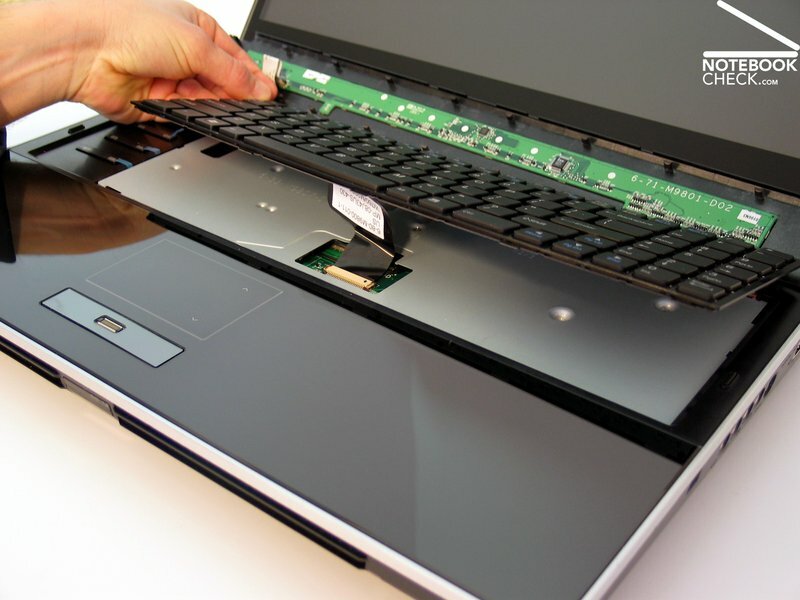 If you want to replace or upgrade RAM, you have to remove the keyboard, because the memory slots are there, so to say, at the back side of the mainboard. 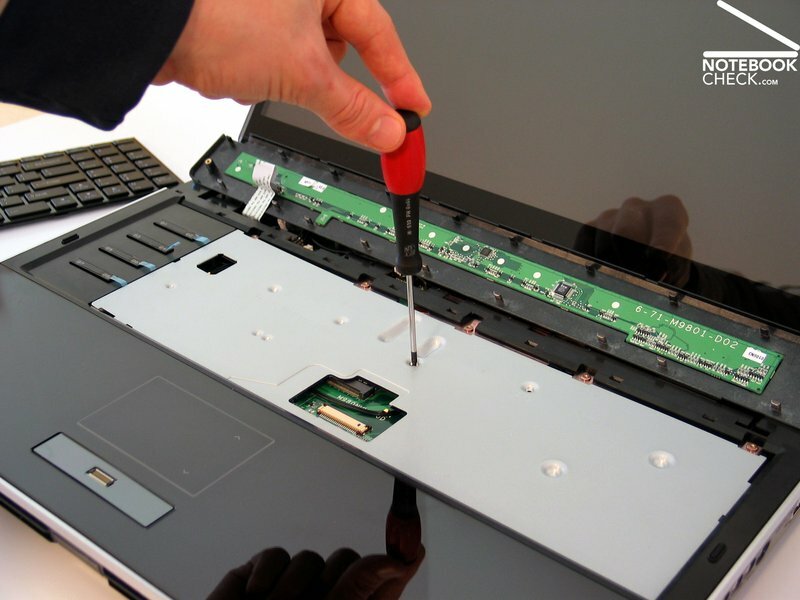 However, this is easily done once some screws are removed. With a total of three slots, which can be populated with 2.5" inch hard drives, the M980NU leaves nothing to be desired. If you, e.g., select mass storage devices with 500 GB capacity, you can easily exceed the magic limit of one terrabyte. 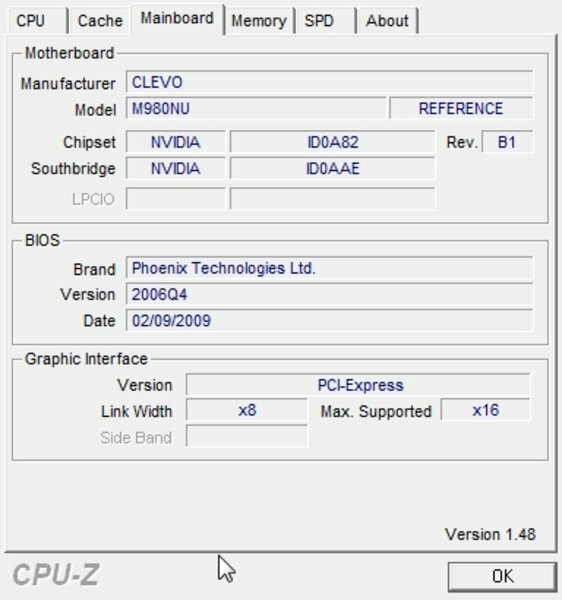 Of course we only run most up-to-date games for checking the gaming performance of the Cleve M980NU with Geforce GTX 280M. Hardly any other game was able to split the gaming community in a comparable way than the newest release of the classic Grand Theft Auto. While some enthuse about the gaming fun, the story, and the graphic, others are upset because of the performance demands of this game. First and foremost the later is true for notebook users, because it is not possible to play this game to some degree smoothly with middle-class notebooks. Of course the demands on the Clevo M980NU are different. It is essential to reach a detail level as high as possible. With all settings on minimum and a resolution of 800x600 pixel the notebook achieved 48.05 frames in average in the integrated benchmark test. With a resolution of 1024x768 and medium details (visual range 21, detail 10, vehicles 50, shade 8) the laptop could still accomplish a very good result of 47.3 fps. Although the observed frame rates are mostly clearly lower when you run the game in practice, GTA IV was still smoothly playable with a good graphical quality with these settings. The M980NU was brought to its knees, when we increased the visual range and the details to 50. This caused the frame rate to drop to 36.15 fps. Here we could observe a stuttering. 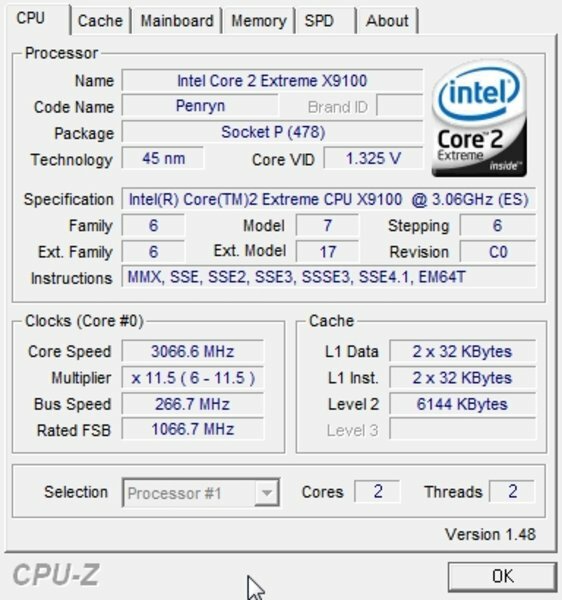 In connection with GTA IV it is also note-worthy that the CPU is very important too. Although the test sample was equipped with a powerful X9100 Extreme CPU, quad-core chips should improve the results of the benchmarks. The Clevo M980NU was capable to run the Crysis GPU benchmark test on high details. With an average of 44.7 fps this game should also run smoothly in practice. In a special article about the new GTX 280M graphic card from Nvidia we also ran numerous other games. Detailled information are available in this special article. 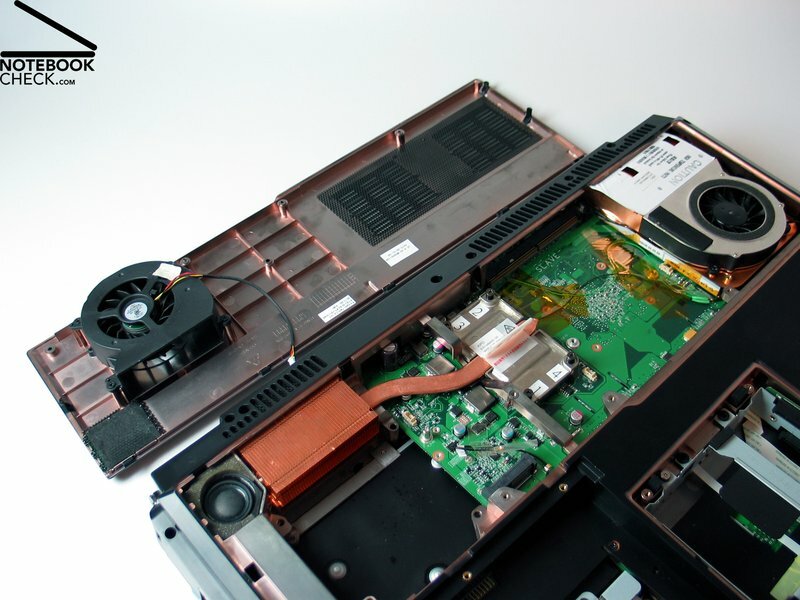 Because we reviewed a pre-production model, whose fan was preconfigured to always run on maximum, it is difficult to say something about the emissions of this notebook. 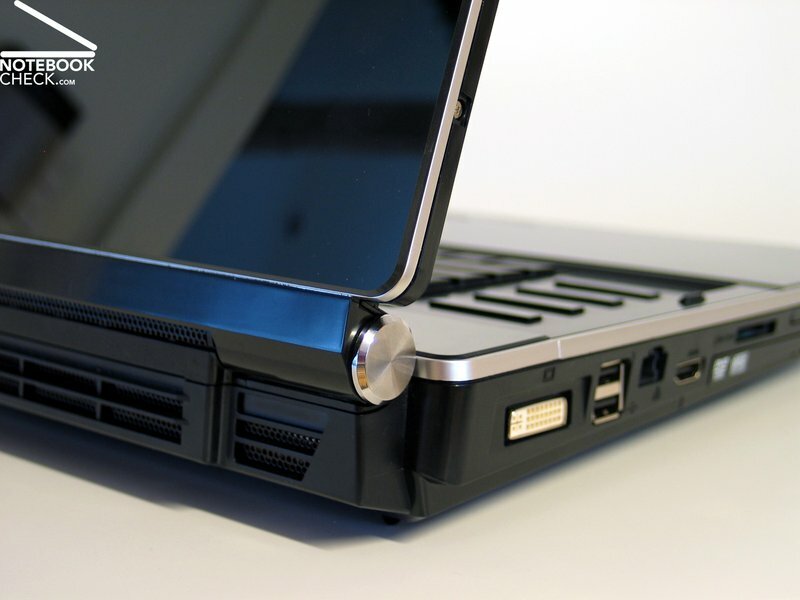 Because there are vent holes at the back part of the case, the warm air can be flow off rearwards. 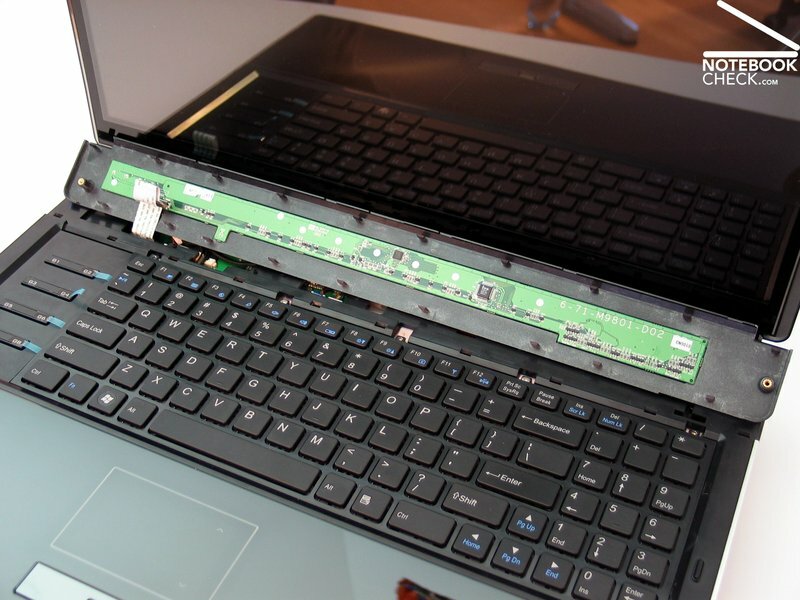 So, it does not disturb working right or left of the notebook. If the sound system is also used in the final model, you can say, it is average. The loudspeakers located on the front edge, emit their sound very directly towards user. However, the subwoofer was hardly perceptible in the soundscape. Although our test sample came with a 68.8W battery screwed(!) into it, it did not work. Be that as it may, you can assume that the battery life of the production model will not be impressive too. Potential buyers won't really mind, as they consider performance most important. The power consumption of our rudimentarily equipped pre-sample was about 57W in idle mode (maximum brightness). In energy saving mode with minimum display brightness it could be reduced to a minimum of 49W. 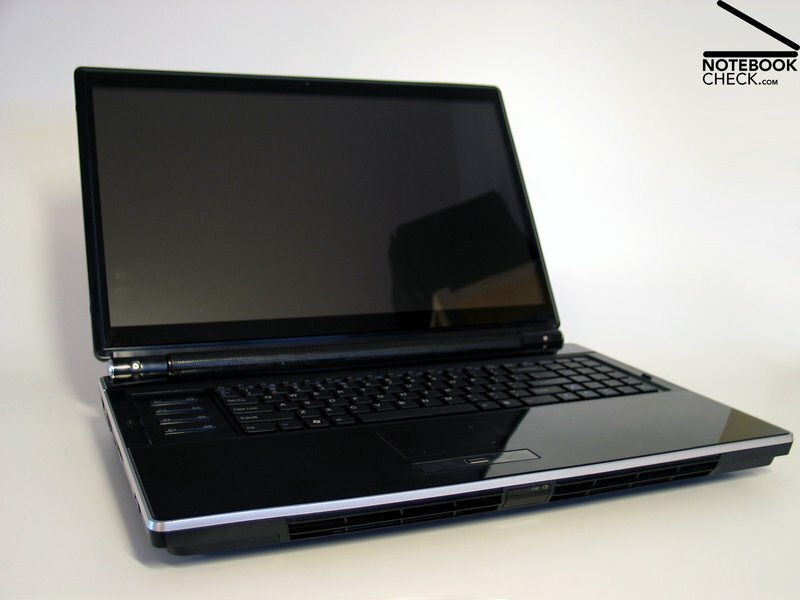 Under load, e.g., when playing GTA IV, the notebook reached a maximum of about 139W. With the M980NU Clevo presents a completely new platform in the high-performance desktop-replacement range. 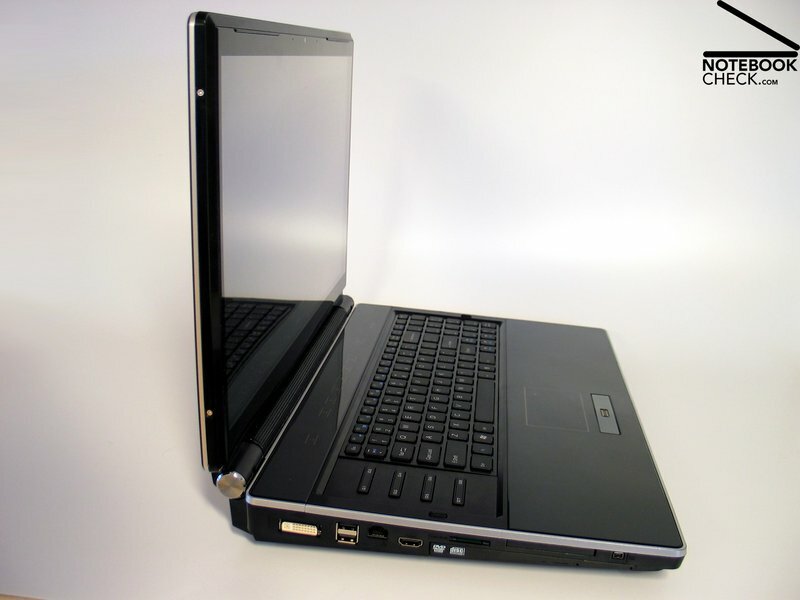 Being equipped with a 18.4 inch display they follow the trend to displays with 16:9 aspect ratio. In total, the case appears to be very huge and the production models will likely weigh about 5.5 kilogramme. 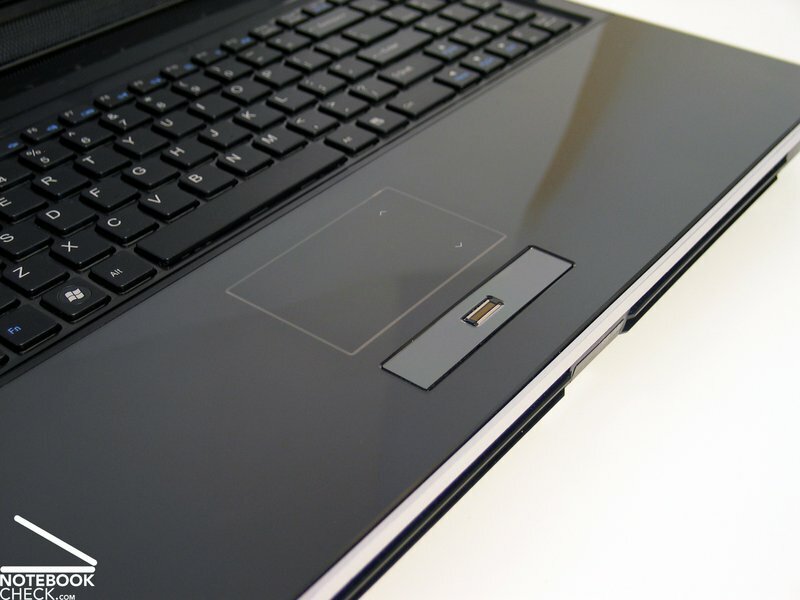 The design of the notebook tries to conceal the size of this laptop and balances simple design and gaming outfit. This is especially done by LED illuminations. 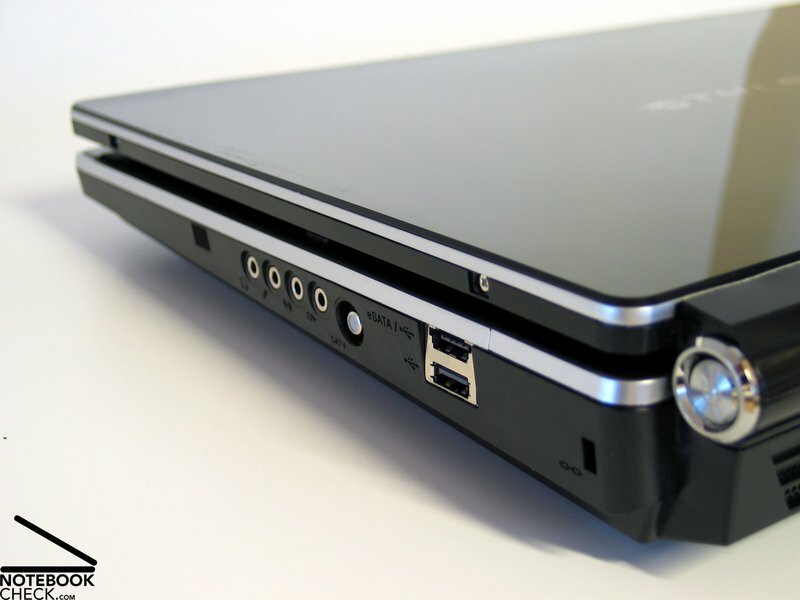 The connectivity includes virtually all important ports, e.g, DVI, HDMI, and USB/eSATA. Regarding communication modules we cannot say much now, however, you can assume that the M980NU will be equipped with Gigabit LAN and wireless LAN standard-n. The same is true for integrated Bluetooth. The offered keyboard looks attractive. Also in use it appears to be more comfortable than e.g., the one of the D901C barebone, because the decent wedge-shape of the M980 allows a comfortable hand posture. 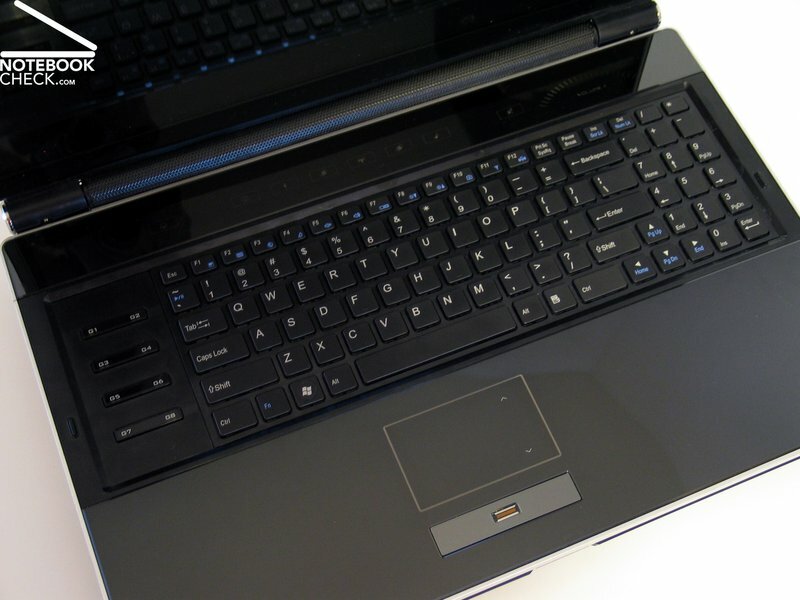 The provided touchpad does not only look like being non-existent, because of its high-gloss and rather sticky surface users might happily do it without this mouse substitute. The built-in 18.4 inch display in full-HD format (1920x1080 pixel) achieved a rather good brightness of up to 220 cd/m² in our test. Furthermore, it scored points by a very good maximum contrast of 595:1. If also the production models are equipped with this screen, you can enjoy a much bigger color space than standard notebook displays offer. However, RGB-LED panels, like the one in the Dell Sudio XPS 16, are still better than this. 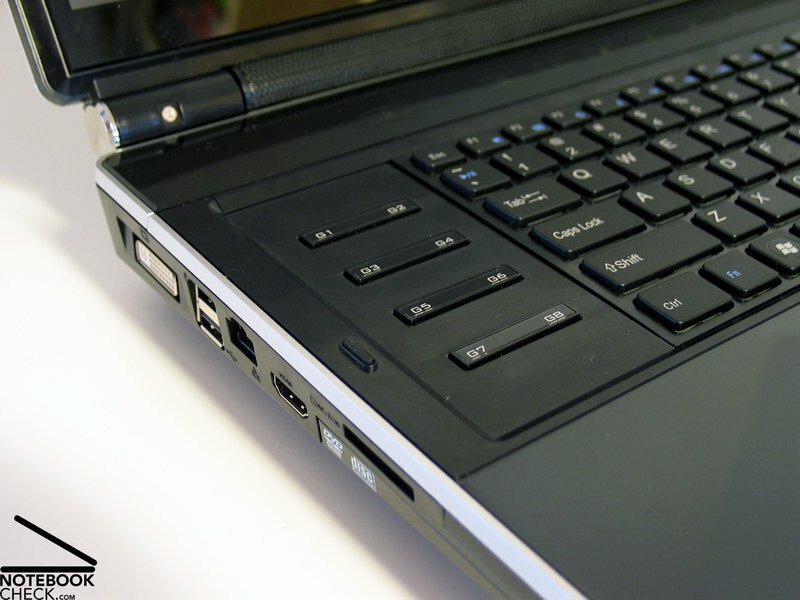 The Clevo M980NU is especially interesting, because this is the first notebook, which utilizes the new graphic card generation from nVidia. The Geforce GTX 280M takes the top compared to other currently available video cards in the run benchmarks. Combined with very powerful Extreme dual- or quad-core processors from Intel, which are used in the M980NU, you can count for first-class performance in virtually all fields of application. It's exiting how Clevo and the resellers will adapt the fan control. In case you simple browse the internet or run simple office tasks, it would be desirable to have a to some degree quieter idle mode. To summarize, the Clevo M980NU left a good impression, not least because of the fascinating new graphic hardware from nVidia. 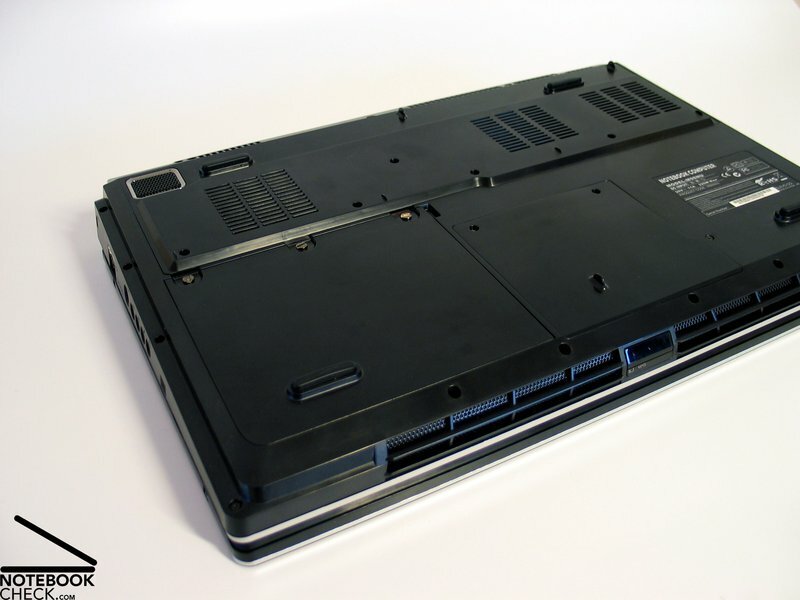 Similar to the M570 barebone you'll get the new 18.4 inch base in numerous configurations from different manufacturers, e.g., from Nexoc, Schenker, or Deviltech in Germany. Considering the key data of the built-in hardware you can assume that the price will start at about 1700.- euro. Fully equipped (2nd video card, quad-core CPU, three hard drives, ...) the price might quickly reach several thousand Euros. You can be curios. 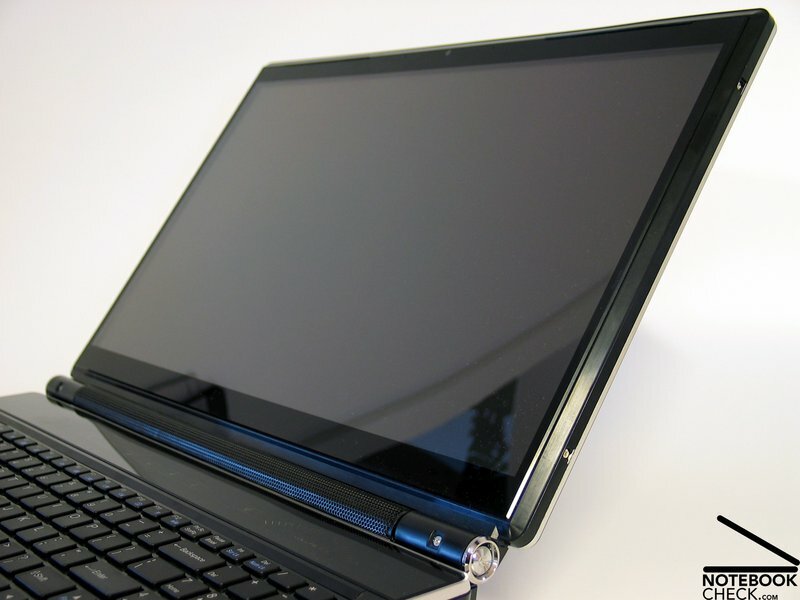 Called M980NU or M98NU Clevo offers a new 18.4 inch notebook. 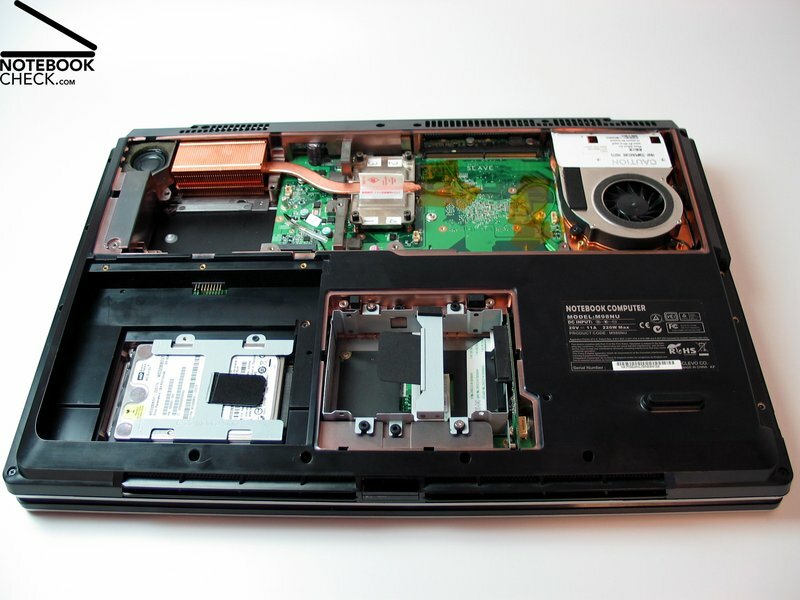 Through a maintenance cover on the bottom side you can access the built-in core components. ...and a brand-new chip from nVidia, a Geforce GTX 280M. Technologically speaking a successor of the FX3700, nVidia intends to take the top of current mobile graphic chips. It is based on the Geforce 9400 chip set, also from nVidia. ...the M980NU can house further two hard drives and therewith easily exceed one Terrabyte total mass storage capacity. ...and a separate one for the CPU. It's still open, how this system handles temperature emissions. The brightness of the pre-sample is throughout good and reaches a maximum of 220 cd/m². Clevo used a 18.4 inch full-HD panel with 16:9 aspect ratio as screen. The 5.5 kilo giant looks decent, but resembles predecessor models like the D901C. Upon activating the notebook it gets interesting as it uses various colorful LEDs. Because of the pre-sample state of our test sample we cannot say much about the workmanship yet. If they are kept, the high-gloss surfaces are optically and haptic striking. However, one can assume that many parts will still be changed and improved. 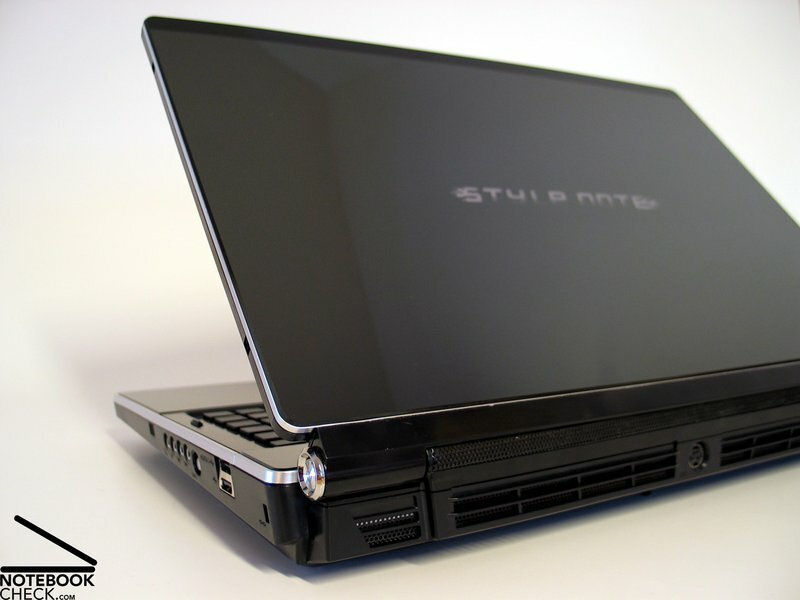 Regarding connectivity the M980NU offers everything a reasonable DTR notebook requires: 4 USB ports, DVI, HDMI, and eSATA. Although only the flanks can be used for interfaces, their order is rather good. Even for the keyboard Clevo apparently let people with "creative mind" tackle the task. These went for a single-key layout in 'Sony-style', which looks good in the huge 18.4 inch case. Optically the touchpad was completely integrated in the palm rest areas. However, this did not have a positive impact on the use. The hot keys left of the keyboard could also not really convince. In order to also score points by soundscape, Clevo equips the M980NU with a subwoofer.